Gary can convert the standard 300B amp to the EXD version and also takes the standard power supply on trade toward the EXS power supply. Gary’s middle name might as well be choke input. He has championed the external, tube-rectified choke-input power supply as a key ingredient to getting the full performance potential from the 300B tube (and tube amps in general for that matter). It has become clear from his show demos and prior reviews that he has succeeded mightily in dispensing with any prior notions that the 300B inherently sounds syrupy with rolled-off highs and weak bass. Fuhgeddaboutit! To kick things off, Gary shipped me the standard SE 300B amp as well as the EXD version with a pair of ElectroHarmonix (EH) 300B and a pair of EH Gold (gold-plated grids) 300B. The owner’s manual was delivered via emailed pdf. I prefer this over any hard copy version and think that in this day and age, it makes a lot of sense to distribute manuals this way. This one was very well written and had excellent diagrams. Things were off to a good start. The amps have a handcrafted appearance with a basic wood frame to which the top plate bolts with steel L-brackets underneath. The bottom plate attaches with six screws. 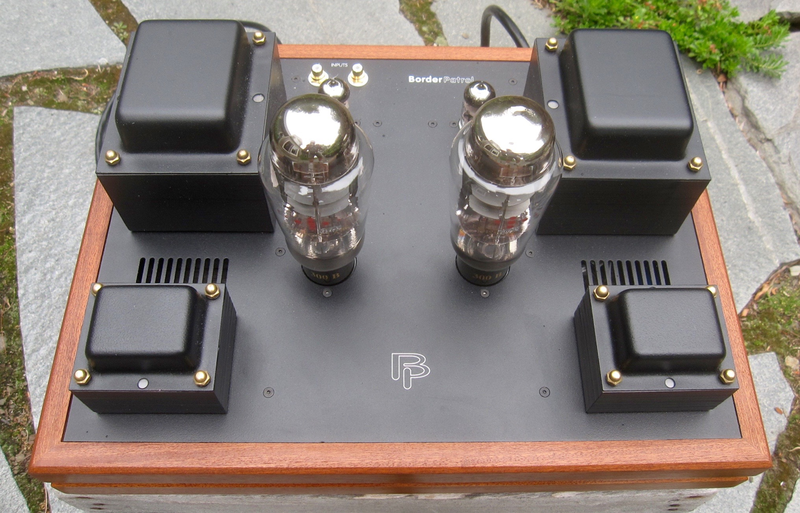 The appearance could be likened to some of the boutique amps produced by James Burgess or Steve Berger of April Sound. The difference is that Border Patrol have a standardized line of products with a more professional market presence. Also, the outboard tube power supply sets the Border Patrol amps apart from most of these. The amplifier circuit topology starts with a Russian (Reflektor or Sovtek) 6C45pi input/driver tube. 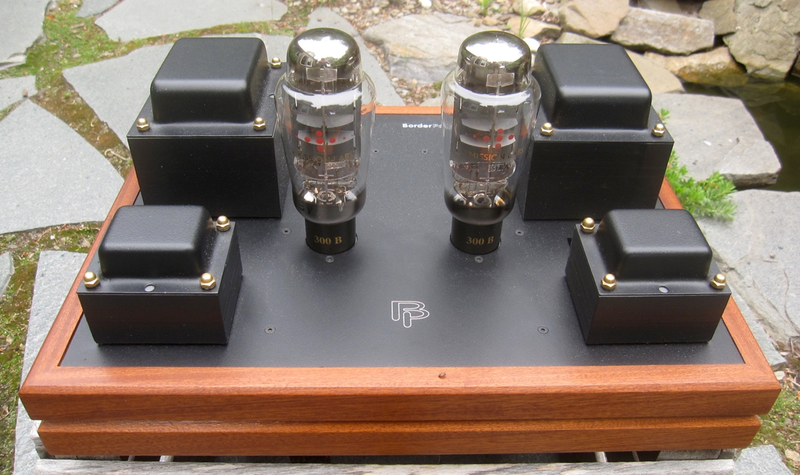 The 6C45pi seems to see increasing usage in SET amps with interstage transformers as the supplies of the Western Electric 417A and some other such good vintage tubes have dwindled. In fact, Graham Tricker of Tron has switched from the WE 417A used in my 15-year old version of his 211 SET amp to the 6C45pi in his newer version called the Telstar. Today’s 6C45pi drives a 1:1 bifilar interstage transformer coupled to a single 300B per channel. This interstage transformer is rated for 25 watts so comfortably overrated for the 8wpc produced by the amp. Gary informed me that the amp does have some headroom of up to about 12 or 13 watts for short music peaks, with the 300B tube going into positive grid overload providing extra power.